The monarch butterfly is a common insect that lives throughout Minnesota during the summer. It's seen in backyards, parks, and in rural areas. Its large size, wide range, and bright orange and black wings make it one of Minnesota's most well-known insects. General description: The monarch butterfly has bright orange wings with black veins and white spots. Length: 3 to 4.5 inches. Weight: Less than one ounce. 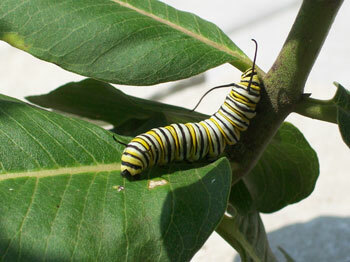 Monarchs develop first as an egg, continue to grow as a caterpillar, and finally emerge as a butterfly. Growing from an egg to a butterfly takes about one month. In the spring, Minnesota monarchs that have wintered in Mexico, fly north laying eggs on milkweed plants there or in southern states. Then the adult dies. One month later, the young butterflies head to Minnesota. The nectar of various flowering plants. Monarch larvae eat only milkweed. Monarchs live in fields and parks where milkweed and native plants are common. Because monarchs feed on flowering plants, many homeowners are converting portions their backyards from grass to flowers to help the butterfly population. Each fall, tens of millions of monarchs, including those from Minnesota, migrate to wintering grounds west of Mexico City. Researchers believe as many as 50 million monarchs migrate south each fall. To help the population, homeowners should plant flowering plants rather than grass or shrubs. To learn more about home butterfly gardens click HERE. 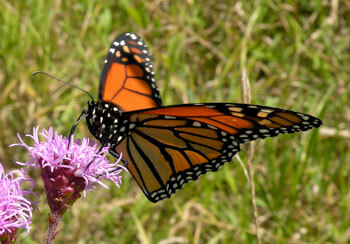 A male monarch can be distinguished from a female by the presence of a black scent gland on each hind wing.